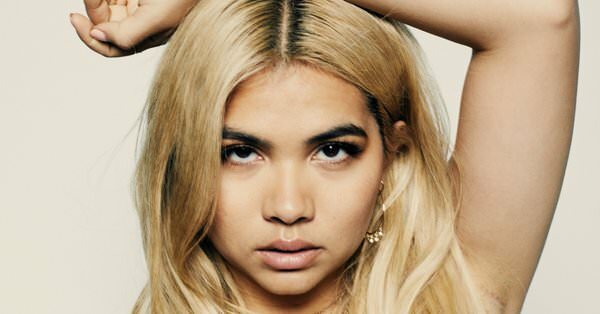 Inside, 27-year-old Hayley Kiyoko – dubbed “Lesbian Jesus” by her fans – awaits. She poses and talks with the lucky ones who paid for meet-and-greet photo ops with the rising star. They ask for prom poses, Ring Pop proposals and cheek kisses (to which Kiyoko politely declines). It’s typical pop awe and excitement, with many teenage participants screaming and smiling from ear-to-ear as they go back to their friends. “Thank you for all you do,” say adult members of Kiyoko’s fanbase. “You inspired me to come out to my parents,” profess some of the younger ones. Kiyoko spent the majority of Pride Month touring in support of her debut album Expectations, wrapping up her headlining trek with two sold-out shows in New York City – a dream for any artist. On her day off between the shows, she pops into a nail salon in Manhattan’s NoMad neighborhood to get a pedicure and fix her gel manicure. These days, a nail salon visit is a rare moment to relax. She’s spent the last five years hitting the ground running to make a name for herself, independently releasing music (until she got signed to Atlantic in 2015) and supporting her music career through various acting jobs, including a main role on the short-lived television series CSI: Cyber. Growing up, Kiyoko always embraced her creative side. In Los Angeles’ Westlake neighborhood, she spent her childhood surrounded by entertainers: her dad, Jamie Alcroft, works as an actor and comedian while her mother, Sarah Kawahara, is a figure skater and choreographer (who most recently worked on the film I, Tonya). During the summers, Kiyoko and her two siblings would go to Florida while her mom worked with Disney on Ice and travel to Utah while she trained with Olympians. It was her parents’ resourcefulness that helped Kiyoko feel like she had limitless opportunity. She became “the queen of lemonade stands” and would collect things like coins, stamps and crystals. After seeing the Disney film Brink!, she wanted to become a skateboarder. She took dance lessons from an early age and developed a passion for drumming — two major elements of her live shows now. But the most important creative pursuit became songwriting. She wrote her first song when she was only six (“Lord knows I had no idea what I was talking about,” she says) and used the medium to validate her own feelings. “Then I had to learn how to sing because I wanted to tell stories,” she explains. As all teens do, Kiyoko was struggling to understand her story the more she began to write it out. She was well-liked in school — a social butterfly who served as class president and was “friends with everyone.” Yet the friendships only lasted during school hours. She was further traumatized in high school when she had her heart broken by her best friend. “I wanted to be in a boy band,” Kiyoko says while dipping her feet in coconut milk and rose petals. She saw *NSYNC in the fourth grade, and as a younger dancer with burgeoning pop star ambitions, it was formative. The dream existed briefly before her anti-pop teen taste set in. She worshipped Fiona Apple and Michelle Branch, two of her songwriting heroes, and listened to drum-heavy music like Sum-41 and System of a Down. Later, she formed the garage band Hede, named after her grandfather, and they won their high school’s Battle of the Bands competition. Meanwhile, she began exploring both acting and singing professionally; in middle school she secured an agent and would go on to appear on various Nickelodeon and Disney shows. Kiyoko began to come around to pop music around this time, citing Katy Perry’s “I Kissed a Girl” as her turning point. So it worked out that her first big break came at the age of 16, in the form of a pop group similar to *NSYNC: The Stunners. She was told that she needed to become a YouTube star and record covers, but she opposed the idea. It was an industry party she was dragged to at age 23 that helped catapult Kiyoko into her new life: She befriended a woman who would introduce the singer to Fabienne Leys, the manager she still works with today. They connected shortly after Kiyoko’s EP This Side of Paradise was completed, and the song “Girls Like Girls” became her launching point. “I was putting out art and no one was watching or hearing,” Kiyoko recalls. Leys encouraged her to put all her energy behind “Girls Like Girls” – the $5,000 independently-produced video ended up getting a million views in a couple weeks, when her channel had only 9,000 views prior. “Girls Like Girls” was only the beginning. Kiyoko needed to keep the momentum and buzz going while supporting herself as an artist. She released a steady stream of music videos that fit into her specific vision and the views would double each time. This Side of Paradise was followed by touring, a major label deal with Atlantic and the EP Citrine. She guest starred on Insecure and appeared in the Netflix EDM film XOXO while recording Expectations, her debut full-length which was originally intended to only have six new songs alongside the previously released six tracks from Citrine. The album covers nearly three years of her life, an especially tough period of time marred by loss and personal health issues. The latter was a particularly terrifying diagnosis of post-concussion syndrome in 2016, brought on after hitting her head at her birthday party that spring. It’s been the best possible timing for Kiyoko to get out from under the dark cloud that hovered over her mental state for the last couple years. Expectations has been widely celebrated by both fans and critics, and it topped off at Number 12 on the Billboard 200. She’s been able to take control of her particular visual desires for the singles, self-directing the videos for songs “Curious” and “What I Need” – the latter serving as an epic road trip love story between her and the song’s featured artist Kehlani. This summer, she’s playing arenas as the opening act on Panic! At the Disco’s North American tour, taking her music to biggest venues she has ever performed in.